Featuring concerts, dances and attractions over the course of three days, Riga’s first Irish pub, Paddy Whelan’s, will celebrate St. Patrick’s Day from March 15 to 17. This will not be an ordinary celebration – it will be a true jamboree*. Friday, March 15th at 10 PM, the folk-rock group RE!PATS! featuring Latvian expats Kārlis Briedis from Canada and Imanta Nīgale from the United States will take the Paddy Whelan’s stage. Additionally, on St. Patrick’s Eve, March 16th at 10 PM, the bluegrass group The DeBillies will entertain listeners. The culmination of the celebration is planned for Sunday, March 17. At 7 PM, the group 51st Division will perform Celtic folk-rock. This ensemble is made up of members of the Latvian post-folk group Iļģi – kokle and bagpipe player Māris Muktupāvels, guitarist Egons Kronbergs (who also plays for The Hobos, Louie Fontaine & Starlight Searches, and others) and bass guitarist Gatis Gaujenieks (the former leader of the Latvian American rock group Akacis and now a sound engineer and producer). The men of 51st Division will be joined by singer and violinist Kristīne Kārkle. 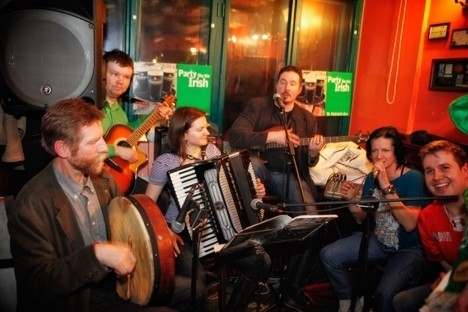 The celebration of St. Patrick’s Day will also be enriched by the Irish folk music ensemble Duan Alta and them leader Ģirts Pētersons. This is one of the rare ensembles in Latvia that stays true to the style of Irish traditional and folk music more than 15 years. The St. Patrick’s Day festivities on both Saturday and Sunday will be made even more enjoyable by the dancers of the dance group Irish Dancing Studio. Participants in the celebration will have the chance to take part in Jameson whisky events, and Guinness, the legendary beer, invites participants to share impressions and photographs from the celebration on the Paddy Whelan’s Irish Pub Facebook “wall” , so that the authors of the ten most impressive photographs can later be awarded prizes. Also, users of the Draugiem.lv site are invited to participate in the photography competition organised by Paddy Whelan’s with prizes worth more than 90.00 Ls shared among the three most active users. Participation in both competitions is restricted to those 21 years of age and older. The day of St. Patrick, the guardian of Ireland and all the Irish, has been celebrated for centuries not just in Ireland, but in all corners of the world that have Irish collectives. Traditionally, this celebration is symbolised by the colour green and the shamrock. As in the legend, St. Patrick used the shamrock as an example of how to explain the essence of the Holy Trinity. In spite of the sad fact that March 17 is the day of St. Patrick’s death, he is celebrated with the traditional Irish festiveness in thanks for how Patrick, as in the legend, saved Ireland from snakes, blessed the Irish and brought Christianity to them. Additionally, the restrictions of Lent were removed because of this celebration. The Irish Pub Paddy Whelan’s opened its doors in the summer of 1995, and is the first and oldest Irish pub in Latvian. The British portal cheapflights.co.uk included Paddy Whelan’s in its list of the 10 oldest Irish pubs outside of Ireland.